The Direct Entry Master’s in Nursing Program is an accelerated, full-time, five-semester, 71-credit course of study designed for non­-RN students who hold a B.S. or B.A. or higher degree in a field other than nursing. This program offers the Clinical Nurse Leader (CNL) track. The CNL is a role in the field of nursing designed to provide master's-­prepared, point-of-care nurse leaders with the ability to manage and solve complex patient problems within a systems framework. Students are admitted with the stipulation that they must pass NCLEX-RN prior to completion of the program. The stipulation is met once the RN license is received. Students are eligible to take the NCLEX-RN after completing a total of 62 credits of accelerated study. The curriculum begins in January and includes two summer sessions. Students graduate as an advanced generalist with a master of science (MS) degree in nursing and upon passing certification examination, as a clinical nurse leader (CNL). Students take the CNL certification examination in their final semester. Students complete a clinical immersion experience of approximately 300 clinical hours. Students conclude their CNL master's preparation in a clinical nurse leader capstone, NURS 958 Clinical Nurse Leader Capstone . Spring: The recommended completed application deadline is April 1st with staggered admissions. Application review will continue until September 15 if seats become available. Letters of recommendation should be substantial with at least one academic reference. Prerequisite Course Verification Form (required): You may use the fillable DEMN Course Verification Form to complete this requirement electronically. All prerequisites must be completed prior to Spring entry into the DEMN Program. Applications will not be considered when grades are unavailable for 2 or more prerequisite courses. Please email the form to the UNH Graduate School. If you have questions about using the form, please contact the DEMN program. Current UNH undergraduate nursing students are encouraged to apply to the Accelerated Master’s program. Deadline Summer: April 1; Fall: July 1; Spring: November 1. See the Nursing Accelerated Master's page for more details. An interview may be requested. Accepted students are required to show immunity by titer for Hepatitis B, Varicella (chicken pox), and MMR (Measles, Mumps, and Rubella) before classes begin as part of clinical requirements. This is a requirement for most nursing programs and should be considered when applying. The Direct Entry Master’s in Nursing program provides an opportunity for accelerated admission to the graduate program for full time undergraduate UNH students who meet admission criteria. 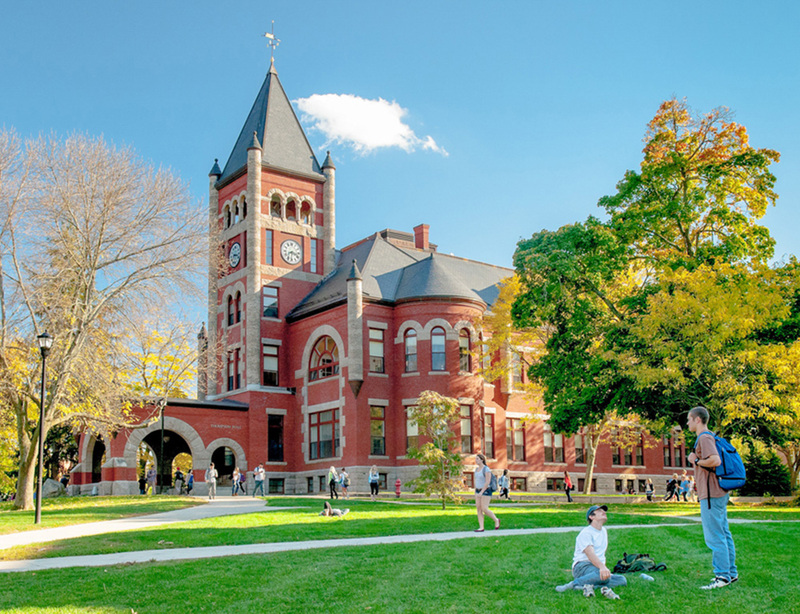 To be considered, current UNH undergraduate students must have completed all major requirements by the fall of their senior year. A grade point average of 3.4 or better is suggested. Previous coursework is taken into consideration. Prerequisite courses must be complete at the time the application is reviewed. These include human anatomy & physiology I and II with labs, microbiology at the cellular level, and statistics with a grade of B or better. The curriculum begins in January and includes two summer sessions. Students graduate as an advanced generalist with a Master of Science (MS) degree in nursing and upon passing certification examination, as a Clinical Nurse LeaderSM (CNL). Direct entry courses taken during the spring of the senior year of undergraduate program will fulfill elective credits to complete BA/BS degree requirements at UNH. This accelerated, full-time program is a five-semester, 71-credit course of study. Students are admitted with the stipulation that they must submit final transcript with degree conferred prior to enrolling in fall semester courses and pass NCLEX-RN prior to completing the program. The stipulation is met once the final transcript and RN license are received. Students are eligible to take the NCLEX-RN after completing a total of 62 credits of accelerated study (including summer). Students take the CNL (Clinical Nurse Leader) certification examination in their final semester. The CNL is a role in the field of nursing designed to provide master's-prepared, point-of-care nurse leaders with the ability to manage and solve complex patient problems within a systems framework. As part of the CNL curriculum, students study master's level research in health promotion and illness management. Students complete a clinical immersion experience of approximately 300 clinical hours. Students conclude their CNL master's preparation in a clinical nurse leader capstone experience. 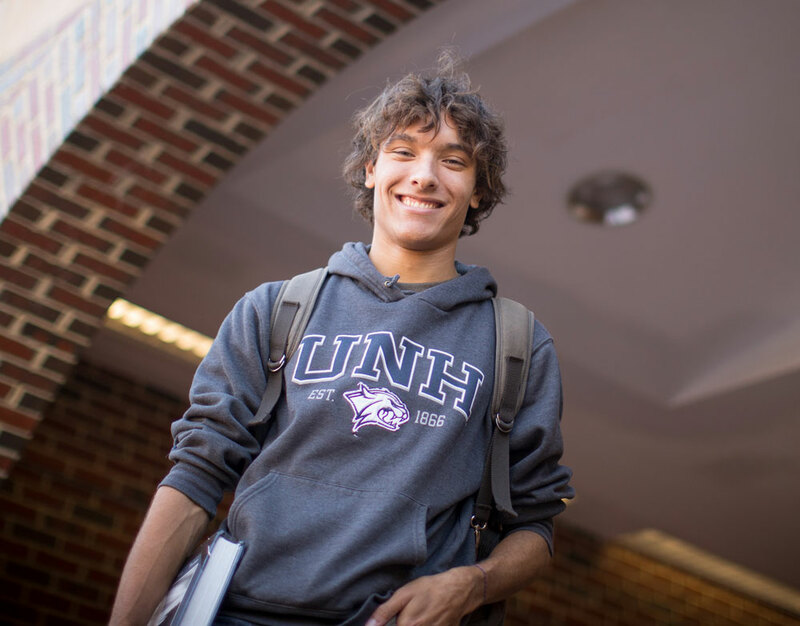 Current UNH students may apply during the second semester of their junior year in major by April 1 with staggered admissions until the class is filled. Applications are reviewed through May then review resumes in September for any remaining seats. Application is completed online on the Graduate School website. The Direct Entry Master's in Nursing (DEMN) program is for non-registered nurses with a BA/BS or higher degree in a field other than nursing. A grade point average of 3.0 or better is suggested. Previous course work and professional experience is taken into consideration. Prerequisite courses must be complete at the time the application is reviewed. Applicants who are in the process of completing a prerequisite course spring semester must have instructor submit grade to date directly to wendy.kaban@unh.edu in the nursing department between April 1 and April 8. These include Human Anatomy & Physiology I and II with lab, Microbiology at the cellular level with lab, and Statistics, all with a grade of B or better. Polit, D. & Tatano, B. (2013). Essentials of Nursing Research: Appraising Evidence for Nursing Practice 8th ed. Lippincott Williams & Wilkins. All applicants who are not native English speakers are required to demonstrate a sufficient level of proficiency in the English language to meet the admission requirement of the Graduate School. Proficiency can be demonstrated by the receipt of a bachelor's or advanced degree from an accredited institution of higher education in the United States or from a university in another country where English is the primary language of instruction. All other non-native English speakers must achieve a minimum score of 550 (paper-based test) or 213 (computer-based test) or 80 (Internet based) on the Test of English as Foreign Language (TOEFL). The GRE and MAT are not required. Individuals interested in the Direct Entry Master’s in Nursing program should apply to the University of New Hampshire Graduate School. The completed application deadline is April 1st with staggered admissions. Application review resumes after September 1 for any available seats. Please note the application is generic for all graduate programs. Application status is posted on the Graduate School website. Letters of recommendation should be substantial with at least one academic reference. Recommendation letters submitted by relatives or friends, as well as letters older than one year, will not be accepted. Interview may be requested. Students accepted into the Direct Entry Master’s in Nursing program are required to submit the following current documents by December 15 prior to beginning program using approved Department of Nursing forms, if applicable. All documents must be current and remain up-to-date throughout the program. Students will be required to pay a late fee of $100 if documentation is not received by December 15. Updated documents must be submitted no later than 30 days prior to expiration to avoid the $100 late fee. Failure to comply with this policy will result in loss of clinical time and may affect progress towards graduation. The student may not attend clinical experiences if this information is not on file in the department the first day of class or if a document expired. A $60 per hour fee will be assessed if clinical make-up hours are allowed. Drug and alcohol testing by approved vendor on assigned date and time; random testing thereafter; and further testing if there is reasonable suspicion or if unable to supply testable sample at the student's expense. *Must have positive immunity titre results for MMR, Varicella and Hep B. If MMR or Varicella titres are negative, the student must submit documentation of boosters; if Hep B titre is negative, student must submit documentation of repeated Hep B series. Titres are not repeated. Graduate Assistantships and Teacher Aid positions are not typically available to Direct Entry Master's in Nursing program students. For financial aid inquiries, contact the Financial Aid Office. The completed application deadline is April 1st with staggered admissions. Application review resumes after September 1st for any available seats. Please note the application is generic for all graduate programs. Application status is posted on the Graduate School website. I notice that the prerequisites are Anatomy and Physiology, Microbiology and Statistics. Are there any others? Prerequisite courses must be complete at the time the application is reviewed. These include Human Anatomy & Physiology I and II, Microbiology at the cellular level and with lab, and Statistics with a grade of B or better. Polit, D. & Tatano, B. (2009). Essentials of Nursing Research: Appraising Evidence for Nursing Practice 7th ed. Lippincott Williams & Wilkins. Prerequisite courses can be taken at any accredited college or university for a letter grade. Do the prerequisites have to be completed by the time I apply? Prerequisite courses must be complete at the time the application is reviewed. If you are in the process of completing the last prerequisite, your application will be reviewed but completed applications are considered first. Complete applications are reviewed in April with decisions made in late May; application review resumes in September with decisions made in October. Graduate students who are enrolled in a degree program at least half time (5 or more credits per semester) and are a U.S citizen or eligible non-citizen may be considered for Federal Financial Aid. Graduate students are reviewed for loans and work study. There are no Federal or University grants or scholarships awarded to graduate students by the UNH Financial Aid Office. To apply for Federal Financial Aid you must complete the Free Application for Federal Student Aid (FAFSA). You can complete the application on-line. The UNH priority deadline for applying for financial aid is March 1. This is the date by which the FAFSA Application must be received by the Federal processor. However, students applying after March 1 will still be considered for the Federal Direct Loan, which is not subject to the priority deadline. All graduate students applying for financial aid must also complete the Graduate Student Credit and Aid Verification Form. The Graduate Student Credit and Aid Verification Form will show as a requirement on your webcat account once we have received your FAFSA. This form is completed electronically. Be aware that the Financial Aid Office will make their offer of aid based on your actual tuition charges. If you will be enrolled for less than 9 credits or paying reduced tuition in either semester, your aid package may be adjusted. If you change your status (e.g., from full to part time), receive a scholarship, tuition waiver or other resource, or correct and/or change the information on the FAFSA, an aid adjustment may result. If I move to New Hampshire, how long do I have to live there before I am eligible for in-state tuition? Each graduate student is classified as a resident or nonresident for tuition purposes at the time of admission to the university. The decision, made by the Graduate School, is based upon information furnished by the student's application and any other relevant information. Nonresident undergraduates continuing directly to the Graduate School will be classified as nonresidents. All applicants claiming New Hampshire residency are required to have been legally domiciled in New Hampshire continuously for at least twelve months immediately prior to registering for the term for which in-state status is claimed. Students admitted from states other than New Hampshire or from foreign countries are considered nonresident throughout their entire attendance at the university unless they shall have acquired bona fide domicile in New Hampshire. Changes in residency for enrolled students as well as appeals are reviewed by the Registrar's Office and will only occur if the student can clearly establish that his or her residence in New Hampshire is for some purpose other than the temporary one of obtaining an education at the university. The burden of proof in all cases is upon the applicant. In all cases, the University reserves the right to make the final decision as to resident status for tuition purposes. The university rules governing tuition rates are fully set forth in the application for admission package; all students are bound by them. How is the Clinical Nurse Leader different from a Nurse Practitioner? CNL: Students graduate as an advanced generalist as a Clinical Nurse Leader (CNL) with a Master’s of Science degree. Graduates are eligible to sit for the Clinical Nurse Leader national certification examination. The CNL is a role in the field of nursing designed to provide master’s prepared, point-of-care nurse leaders with the ability to manage and solve complex patient problems within a systems framework. As part of the CNL curriculum, students study master’s level research in health promotion and illness management. Students complete a clinical immersion experience of approximately 300 clinical hours. Students conclude their CNL master’s preparation with a capstone project. FNP: The program prepares family nurse practitioners (FNPs) with specialized knowledge and clinical competency to practice as licensed independent practitioners across the lifespan. FNPs practice in ambulatory, acute, and long-term care as primary and/or specialty providers to individuals, families, and groups. The UNH program prepares these advanced practice registered nurses (APRNs) to diagnose and manage acute episodic and chronic illnesses across the life span and simple to complex continuum. Health promotion, disease prevention, teaching, counseling, and coaching are emphasized. The capstone course, NURS 939, is the final integrated clinical practicum. At the completion of the program, students are eligible to sit for national certification as a family nurse practitioner. Students are also prepared to enter doctoral study. Upon licensure, FNPs may practice autonomously as well as in collaboration with other health professionals. I have been out of school for a long time. How long are my credits transferable? There is no time limit for course credits. Prerequisite courses are not transferable; they are taken prior to entering program at the undergraduate level. Who is eligible to submit a letter of reference? References should be substantial with at least one academic and two current professionals with graduate education background, no family or friends. If an academic reference is not available, three current professionals with graduate education background may submit a letter of reference. If my GPA is not 3.2 should I still apply or is my application automatically declined? A grade point average of 3.0 or better is suggested. Previous course work and professional experience is taken into consideration. Do I need to take GREs? Can I meet with someone to discuss the CNL role? Appointments are available with the Coordinator of the Direct Entry Master’s in Nursing Program, Dr. Pamela DiNapoli, ppdn@unh.edu. Yes, transcripts are required from all institutions where academic credit was received. How many applications do you expect and how many seats are available? The number of applications vary year to year - between 60 and 80. Each cohort has 24 students who complete the program full time. Can I complete the program part time? The program begins each January and is completed in 5 semesters, full time only, including 2 summers. Can you tell me what a typical semester looks like? Students are usually in class 2-3 days/week plus 1-2 days/week of clinical, depending on semester. Classes are held during the day; clinical hours may be days or evenings, including some Saturdays, depending on agency and faculty availability. Where are students placed for clinical experiences? Clinical sites are typically within a 60 minute drive from the UNH campus in Durham. Students may need to plan for a longer drive, depending on residence. Placements are based on agency and faculty availability. Students are expected to spend 3 hours per credit outside the classroom/clinical with assignments. This means a 4 credit course should include 12 hours of study per week outside the classroom. Students must have a driver’s license and reliable form of transportation. Neither public nor university transportation are available for students attending clinical. Do I need healthcare experience?